Christina will build an in vitro biorelevant ‘flow-through’ model that reproduces luminal drug concentrations vs. time profiles that have been previously measured in humans. She will further measure luminal drug concentrations vs. time after administration of a bio-enabling formulation to healthy adults in the fed state and optimise the in vitro testing methodology based on the collected luminal data. Christina received her Diploma of Pharmacy from the National and Kapodistrian University of Athens, Greece. 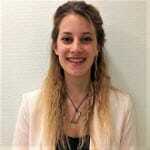 Her diploma thesis was entitled "Modeling Pharmacokinetics and Pharmacodynamics of granocyte colony stimulating factors given as single and repeated doses in healthy volunteers" and was performed at the Faculty of Pharmacy at Aix-Marseille University, France, as part of the Erasmus student exchange program. She then completed her Master of Science in pharmacokinetics at the Faculty of Pharmacy, Aix-Marseille University, France. Furthermore, Christina did a one-year internship in the field of drug metabolism at Novartis AG (Pharmacokinetics and Pharmacometrics) in Basel, Switzerland, focusing on data exploration, biologics’ kinetics, model building and population analyses.